Service Bus Messaging, which includes entities such as queues and topics, combines enterprise messaging capabilities with rich publish-subscribe semantics at cloud scale. Service Bus Messaging is used as the communication backbone for many sophisticated cloud solutions. The Premium tier of Service Bus Messaging addresses common customer requests around scale, performance, and availability for mission-critical applications. The Premium tier is recommended for production scenarios. Although the feature sets are nearly identical, these two tiers of Service Bus Messaging are designed to serve different use cases. Some high-level differences are highlighted in the following table. Service Bus Premium Messaging provides resource isolation at the CPU and memory level so that each customer workload runs in isolation. This resource container is called a messaging unit. Each premium namespace is allocated at least one messaging unit. You can purchase 1, 2, or 4 messaging units for each Service Bus Premium namespace. A single workload or entity can span multiple messaging units and the number of messaging units can be changed at will. The result is predictable and repeatable performance for your Service Bus-based solution. Not only is this performance more predictable and available, but it is also faster. Service Bus Premium Messaging builds on the storage engine introduced in Azure Event Hubs. With Premium Messaging, peak performance is much faster than with the Standard tier. The following sections discuss a few differences between Premium and Standard messaging tiers. Partitioned queues and topics are not supported in Premium Messaging. For more information about partitioning, see Partitioned queues and topics. Because Premium messaging runs in a completely isolated run-time environment, express entities are not supported in Premium namespaces. For more information about the express feature, see the QueueDescription.EnableExpress property. If you have code running under Standard messaging and want to port it to the Premium tier, make sure the EnableExpress property is set to false (the default value). Management operations such as CRUD (Create, Retrieve, Update, and Delete) operations on queues, topics, and subscriptions. The additional CPU And memory usage is not priced additionally though. For the Premium Messaging tier, there is a single price for the message unit. Understand the capacity of resources purchased. Capacity planning that helps you decide to scale up/down. Getting started with Premium Messaging is straightforward and the process is similar to that of Standard Messaging. Begin by creating a namespace in the Azure portal. Make sure you select Premium under Pricing tier. Click View full pricing details to see more information about each tier. 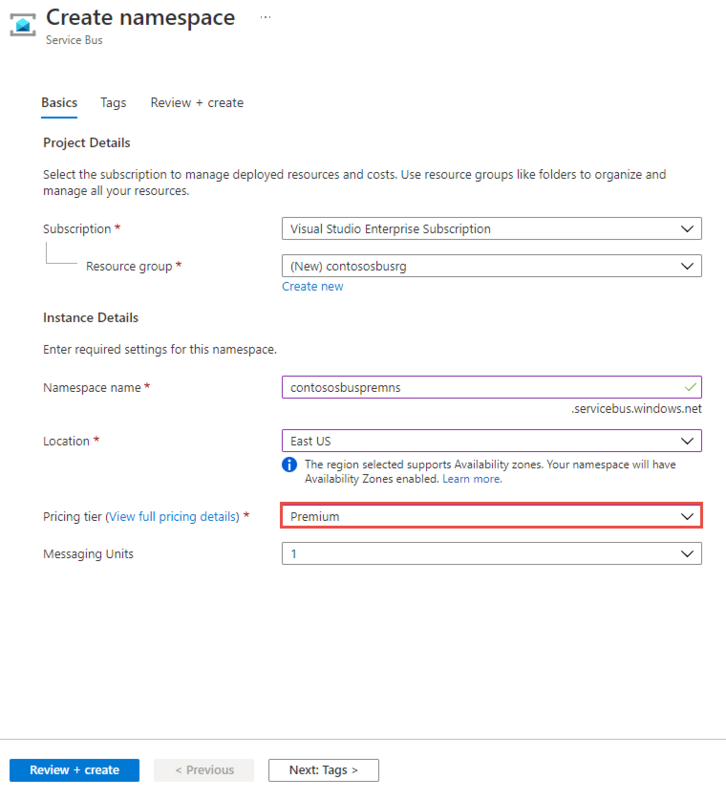 You can also create Premium namespaces using Azure Resource Manager templates.